Daily Prompt: What does happiness look like to you? This entry was posted in Misc and tagged Cavachons, dogs at play, happiness. Bookmark the permalink. 22 Responses to Daily Prompt: What does happiness look like to you? Our dog did that and I just got annoyed. You are a better person than I. 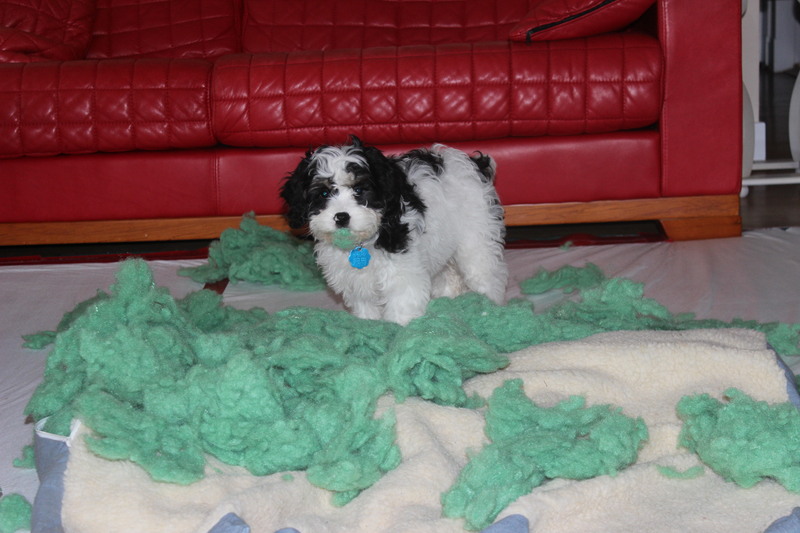 No, Peg, I’m the world’s worst pet owner….rarely train and discipline and just laugh at the puppy things they do. As you can imagine, it drives Patty crazy. When it comes to dogs, I’m a cuddler not a fighter. She just loves the color….it’s her favorite….seafoam green….so that’s why you can now all see it. It’s her way of telling you she would like you to buy her a lovely doggie wrap in that shade. Makes sense to me….but then, people do question my logic. LOL. I believe you have finally bridged the communication gap between humans and dogs, Cindy! That would be me. She has my heart and can get away with just about anything. Yup, I know the feeling. Can’t get or stay mad at those little darlings! And she could not look any more adorable doing it, could she? Nice header photo. Thanks, Patti. She’s too cute to get mad at. Maybe she is trying to tell you something! That’s for sure. She talks to me constantly. I need to learn how to speak Cavachon. Oh well I suppose that is different isn, t it? Happiness is in the eye of the pup. OMG very very bad, yet happy, dog. Wait…was the dog angry? No Elisa, unfortunately this is considered good clean fun in the dog world. Thanks for commenting. She never tears her own bed apart….only the ones for the other dog (a Labrador retreiver). Maybe she wants to share her bed? At least it wasn’t the sofa!! She would never destroy the sofa. That’s her favorite bed.